All your weekly needs can be ticked off with these three top picks from Sassind. From park time with the kids, brunch with the girls, a day at the beach, to office meetings and a romantic date night, I have flipped the term loungewear on its head! Yes this is possible when you invest in good clothes made out of quality fabrics and classic cuts from Sassind. Let's take a look. Sass up that park time with or without the kids in this white and green stripe boxy top from Sassind with a pair of denim overalls. If you aren’t an overall lover don’t despair, the green stripe shirt will modernise any light or dark denim item in your wardrobe. The top is long enough to tuck into your favourite pair of jeans but isn’t too long that it will make you look shapeless if you want to wear it untucked. I’m wearing a small size and as you can see It’s a generous cut. The litmus test to determine what is ‘true’ loungewear is that it should be stylish enough that you can go from lazing on the couch at home to catching up with friends for brunch/lunch without having to change a thing. Sassind’s loungewear transcends this definition. For a hassle free brunch date pair these luxurious 100% wool jodhpurs with the green stripe boxy top, a set of white sneakers or tan ankle boots and you will have admirers wherever you go. This has literally happened to me! Every time I wear these jodhpurs I get asked “where are your pants from” or “oh wow I love your pants”. Believe it or not wool is a great fabric to wear to the beach and is good for our oceans too. Wool garbs unlike polyester ones, don’t shed microfibres when you wash them. These invisible fibres are so small they can’t be filtered out by waste treatment plants. As a result they end up in our waterways and wreak havoc on marine animals and the environment. I recently wore the Green Stripe Top, wool jodhpurs and the oversized wool wrap on a day trip to beautiful Palm Beach on the Gold Coast and was super impressed with how great they felt and worked in the sand. The wrap not only kept the chilly sea breeze at bay but provided me with great sun protection too. I chose the cream colour wrap to add a point of difference to my Winter wardrobe and to also compliment my Summer one. Going to that business meeting just got a bit more exciting in Sassind. Once tied with a sleek ankle boot and a classic black jacket, the green stripe boxy top and wool jodhpurs can hold their own in a pow wow session at head office. I’m wearing the small size which is true to size around the waist. The drop crotch style and side pockets provide extra room and matches the comfort level of your favourite pair of track pants. Take the last look up a notch without the fuss. I’ve gone from boss-lady chic to a romantic dinner glam look with the same top and bottom. I’ve added this victorian inspired detached frill collar; a surefire trend that is now taking over 2018 initiated by ateliers Erdem, Christophe Lemaire, John Galliano and, of course, Valentino. But if fancy collars aren’t your thing, just use a statement piece of jewellery and although I’ve swapped the office jacket with a velvet coat, you don’t need to change your outerwear in order to pull off a luxe after 5 look with these basics from Sassind. Another stunning after 5 look can be created using the Sassind merino wool wrap as a statement top by simply adding a belt. The wrap draped in this way looks superb with the wool jodhpurs and a pair of black pointy heels. Embrace the use of natural fibres and material sourced from ethical and sustainable practices as they will make you feel great, look great and enable you to do good! 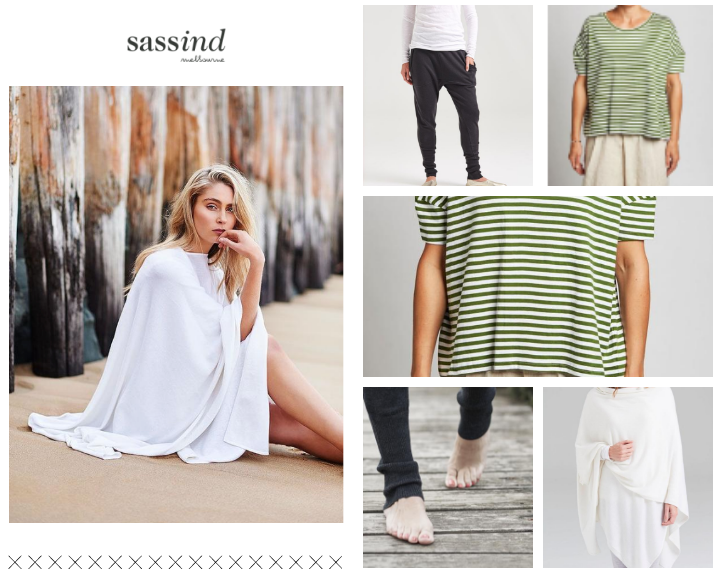 Don’t forget to share your sassy moments in sassind by @mentioning us @sassind_melbourne @sustainablestyling and #tagging us #sassind and #sustainablestyling on Instagram and Facebook.